Camp Security is a Revolutionary War period prisoner-of- war camp that was occupied by British, Scottish and Canadian prisoners and camp followers (often wives and other family members) between 1781 and the end of the war in 1783. The site is located about four miles east of the City of York, in a relatively small, undeveloped portion of suburban Springettsbury Township. Thirty years ago, Barry Kent and Charles Hunter, archaeologists at the State Museum, located over 100 features here containing artifacts dating to the latter part of the 18th century. In all likelihood, these artifacts are related to the prisoner of war camp. Most of the features are pits, which were dug into the ground and which ultimately became receptacles for a variety of domestic debris. The most numerous objects recovered from the pit features are discarded animal bones representing food refuse. A preliminary analysis of this faunal material (by Brenda Carr Weller, Lab Manager at McCormick Taylor, Inc.) indicates that beef and lamb were important components of the diet at Camp Security, with smaller amounts of pork and domestic fowl also represented. Wild food sources included small amounts of turtle. It appears the livestock was slaughtered and butchered on site, and the meat was probably eaten as large roasts and stews. These faunal remains suggest the inmates at Camp Security were reasonably well provisioned with food. This is in stark contrast to the experience of thousands of American prisoners who were captured when the Continental Army evacuated New York City in 1776. Many of the Americans were incarcerated in the notorious British prison ships anchored near the Brooklyn shore, where they were deliberately starved by their captors. Other artifacts from the 1979 dig include thousands of fragments of window glass believed to be from the numerous log huts which were built as housing, according to contemporary written accounts. Pieces of clay “daub,” the material used for the chinking to seal gaps between the logs of the huts, were also recovered. 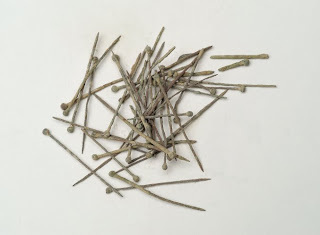 The 1979 investigation also recovered hundreds of copper straight pins and crude buttons fashioned from animal bone. This corroborates the written accounts of the practice of “cottage industries,” such as the manufacture of lace and buttons, by the occupants of Camp Security. Currency, such as silver “pieces of eight” (Spanish coins known as “reales,” which were sliced into eight pieces so as to make “change”) was also found. This appears to corroborate written accounts that certain prisoners were allowed to work for local farmers and earn wages. Noticeably absent from the Camp Security collection are items such as fragments of tobacco smoking pipes and liquor or wine bottles. Such artifacts are often abundant on domestic sites dating to the 18th century. However, dozens of other personal items such as buttons, buckles, cuff links and clothing clasps are represented in the Camp Security collection. One unique item is a silver brooch in the shape of a heart. This is a distinctly Scottish piece of jewelry, and members of at least one Scottish regiment of Highlanders are known to have been present at Camp Security. This brooch signifies a weeping heart and was given as a farewell token and hopefully, brought protection to a loved one who had been sent to the war in America. This week's guest blog is courtesy of BHP Historic Preservation Specialist Mark Shaffer. This week’s entry, our fourth in a series of donations to the State Museum of PA, showcases a collection of artifacts from Virginia Lopresti. A long time member of the Forks of the Delaware Chapter of the Society for Pennsylvania Archaeology, Virginia chose to donate some of her artifacts to the State Museum’s Section of Archaeology in 2005, and the Museum graciously accepted. One of the earliest recorded archaeological sites in Northampton County, 36Nm11 was first registered in 1967. Over the years Ms. Lopresti has been an avid surface collector on this site, a portion of which lies in her back yard. Virginia has amassed a sizable assemblage of not only whole, diagnostic projectile points, but also expedient flake tools, scrapers, chipping debris of a variety of lithic materials, hammerstones, pitted stones and pestle fragments. From bifurcates to broadspears, the bulk of the diagnostic points imply an Archaic occupation (9000 to 3000 years ago). 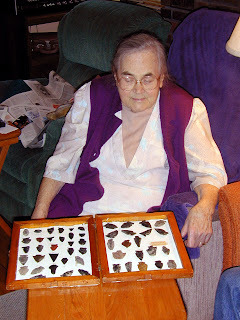 With 15 grandchildren, Virginia has understandably decided to hold on to her framed projectile points to pass along for them to enjoy. However, the value of the rest of the collection cannot be overlooked, and in some ways they can be viewed as a “more complete sample” of the site. Because there was no bias towards only whole projectile points, this type of collecting provides the archaeologist with a more representative sample of artifacts and can aid in interpreting site types and their function. The State Museum has no other collection from this site, and Ms. Lopresti’s generous artifact donation contributes important information about regional settlement patterns and culture change during the prehistory of the Middle Delaware Valley. 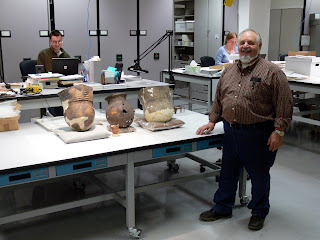 In May 2007 Lou Farina, Forks of the Delaware Chapter 14, Society for Pennsylvania Archaeology Inc., donated four pottery vessels to The State Museum of Pennsylvania. These exceptionally fine examples of Native American origin were recovered by Mr. Farina and others during salvage excavations at the Overpeck Site from 1963-1967. Located on a terrace of the Delaware River at Kintnersville, Overpeck was a stratified multicomponent archaeological site lost to a soil mining operation. Overpeck is perhaps best known for the pottery type Overpeck Incised, a unique Late Woodland type that has been described by John Witthoft (1947), former State Anthropologist and long time member of Chapter 14. Through the efforts of the chapter much information was garnered from the Overpeck Site investigations which has led to the completion of several reports published in Pennsylvania Archaeologist (Forks of the Delaware Chapter #14, 1980; Freyermuth and Staats 1992). Of importance at Overpeck was the discovery of fourteen human burials, some containing early Contact Period European trade metal in the form of beads and pendants. The remains were disturbed by the mining operation though enough information survived that allows for some interpretation of the burials and their place of origin in history. Comingled with these deposits confined to the upper soil layers at Overpeck were numerous Late Woodland and Contact period potsherds essentially representative of the entire Delaware Valley sequence. Of interest, however, in the present discussion are the four vessels reconstructed by Mr. Farina as depicted in Figures 1 and 2. The large central vessel is of the Iroquois Linear type common over much of Iroquoia and dates to the circa 13th century A.D. The small vessel at its base, a "toy or juvenile" pot is from the Susquehannock occupation at Overpeck and dates to the Contact period (circa late 16th century A.D.). The two remaining large vessels, as well , are Susquehannock and fit with the Schultz Phase which is also dated to the latter part of the 16th century in the adjacent Susquehanna Valley. 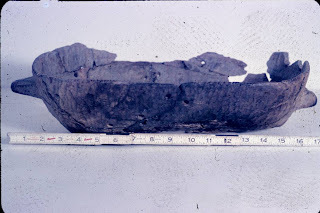 As a side note, there have been other Susquehannock pottery specimens found at the Overpeck Site and many of these are curated at the State Museum of Pennsylvania where they can be studied by researchers and others interested in Native American material culture. The Farina donation of artifacts from the now lost Overpeck Site has added a new dimension to our understanding of Delaware Valley history. 1980 The Overpeck Site (36Bu5) Pennsylvania Archaeologist 50 (3): 1-46. 1992 A Supplementary Report on the Late Woodland Ceramics from the Overpeck Site (36Bu5) Pennsylvania Archaeologist 62(1): 53-61. Nd. The Overpeck Site. Unpublished manuscript in the manuscript files of the Section of Archaeology, State Museum of Pennsylvania. It is difficult to summarize the many contributions of David J. Werner to Pennsylvania archaeology in one posting. Mr. Werner was a WWII veteran and worked most of his post-war civilian career as a ticket agent for the Erie railroad. A dedicated avocational archaeologist in his spare-time, Mr. Werner was a founding member of the Society of Pennsylvania Archaeology, the Lenape Chapter 12. His collection encompasses over 40 years of archaeological investigation of the Upper Delaware River Valley on both the Pennsylvania and New Jersey sides. His son, David Werner Jr., donated the collection to The State Museum of Pennsylvania in 2004. Stored in every nook and cranny of Werner Sr.’s basement and attic, the extensive collection included over 175 boxes of artifacts and excavation documentation from over 36 prehistoric and historic sites. The sheer magnitude of the Upper Delaware artifact assemblage is noteworthy in and of itself. However, the collection’s true value is found in the diligent recordkeeping of Mr. Werner and fellow members of the Lenape Chapter 12. Under the field direction of Mr. Werner, sites were excavated in controlled units that were documented with detailed maps and excavation records. A great deal of time was also spent organizing site collections and compiling artifact inventories after field work was done. Artifacts were documented, sorted, boxed and bagged by site provenience and in many cases labeled with catalog numbers. 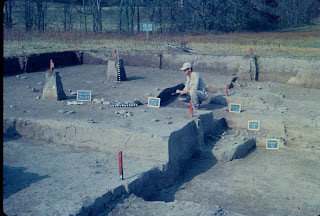 It is this attention to detail that arguably produced his most significant archaeology contribution to the Commonwealth, the publication of his report on excavations at the Zimmermann Site (36Pi14) in Archeology in the Upper Delaware Valley (Kinsey, 1972). In 1960s and early 1970s, the professional archaeological community enlisted members of avocational groups to aid with the identification and excavation of sites endangered in the proposed Tocks Island Reservoir Project Area. The Zimmermann Site was discovered by the Lenape Chapter while conducting a site survey between Matamoras and Dingmans Ferry, Pennsylvania, and was the largest of many archaeological sites investigated by Chapter members during this period. The site’s unique stratigraphic sequence has added greatly to the regional understanding of the change from Late Archaic hunter/gather lifeways to more horticultural lifeways developed during the Early and Middle Woodland Periods. Zimmermann is a multi-component prehistoric site, with several isolated occupational zones. 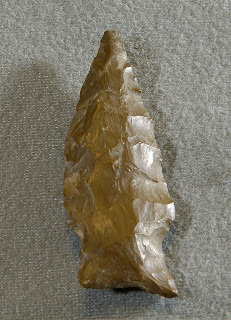 Werner was able to identify a distinct regional projectile point type, the “Dry Brook Fishtail” and proposed the “Dry Brook” cultural complex based on Level 3 excavations (Radiocarbon date 1280 B.C.). Also found associated with nearly three hundred identified “Dry Brook Fishtail” points in Zimmermann Site Level 3 were sixty-seven hearth features, twenty-one of which were large platforms of fire cracked rock ranging in size from 5 to 22 feet in length and 193 steatite (soapstone) bowl fragments from an estimated 32 individual vessels. This excavation level produced some of the largest reconstructed steatite vessels found in Pennsylvania to date. For more information about the Zimmermann Site and the archaeology of the Transitional Archaic Period check out the following link and reference. Each week this month will focus on an artifact collection generously donated to the State Museum Section of Archaeology by an amateur archaeologist. Well documented collections with detailed provenience information are of particular significance because they have the potential to contribute the most information about Pennsylvania prehistory. However, archaeologists are able to compare and examine all collections to interpret broad cultural changes. The most recent donation to The Section of Archaeology comes from Mr. James H. Armstrong and provides us with additional specimens from an important site in the Susquehanna River Valley. Mr. Armstrong received this collection from his grandmother and decided to donate the artifacts so that they would be preserved for future generations and to assist in the research of early occupants of Pennsylvania. The projectile points in this photograph were made by native peoples who occupied the Lower Susquehanna River. The points date from the Archaic Period (8000-1800 B.C.) thru the Late Woodland Period (800 -1550 A.D.). These periods are defined by changes in technology and changes in lifeways. The points at the bottom of the photo are the earliest, Archaic, and the points at the top represent the Woodland Period. The stone tools in this photograph are representative of the Archaic and Middle Woodland Periods. During this time native peoples were evolving from a hunting and gathering lifestyle to one more dependent on horticulture. The notched net-sinkers would have been used along the river for securing fishing nets. The other tools function as wood-working implements such as the grooved axe (top), and the celt (second row, right) and chipped stone axe (second row, left). The third row includes three unfinished bifaces, left to right, which are essentially “blanks” for projectile point production. On the far right is a pick possibly used for carving steatite vessels dating to the Transitional Period (1800-1200 B.C.). Archaeologists know the function and age of these artifacts through careful excavation of stratified archaeological sites and analysis of the levels at which these artifacts are found. 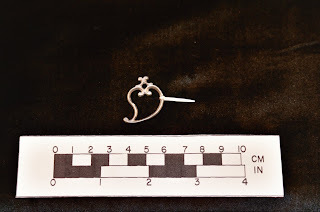 We have blogged the past few weeks about the C-14 and AMS dating of artifacts and how archaeologists determine the age of artifacts. By compiling data from lots of sites and artifacts we are able to determine the point styles associated with the Archaic and Woodland Periods. Stratified excavations that then yield points produced by the same techniques as the dated points are considered contemporary. Changes in shapes of points indicate a change in technology or function over time. Hunters prior to the Late Woodland Period are using a spear thrower or atlatl and the points are notched in various forms to allow for hafting to the spear shaft. In the Late Woodland Period the change in shape of projectile points indicates a shift to bow and arrow technology. Please consider donating your collection to The State Museum to further our understanding of the heritage of our Commonwealth and Preserve our Past for the Future.